It's just like your backyard! Except no mismatched patio furniture. And your backyard probably doesn't hold several thousand people. 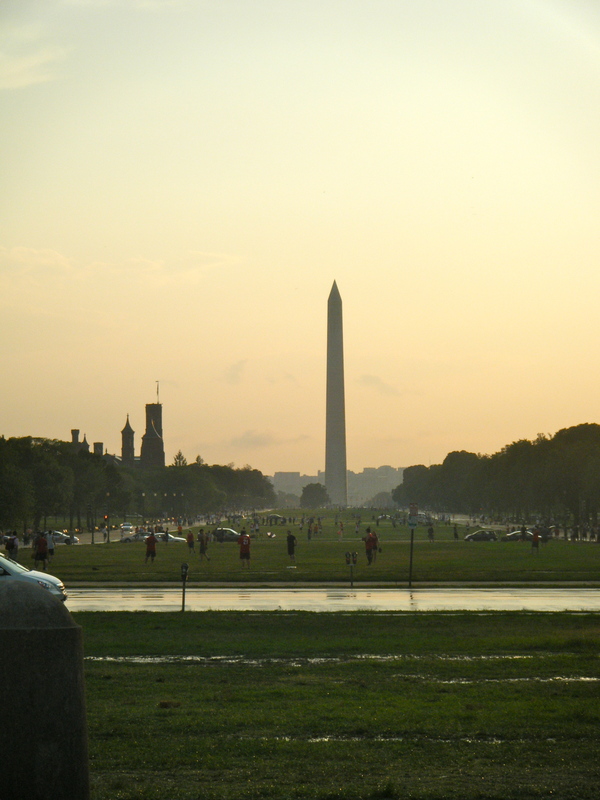 When I first heard the National Mall referred to as “America’s Backyard,” I rolled my eyes. That phrase just sounds saturated in American kitschy-ness, conjuring up images of people from all walks of life getting together, grilling hamburgers and shooting the breeze as their bandanna-clad golden retrievers named Buddy bound happily through the grass. Which probably sounds like a lot to be getting out of only two words, but hey, words are powerful. But, despite how corny it sounds, in a way the Mall does feel a bit like America’s backyard (but you don’t have to mow it yourself!). Today was my first time just casually walking down the Mall – previously I’d only used it as a pathway to museums, not really paying attention to the space itself. I was amazed at how active and vibrant it was on a Thursday evening. There were dozens of recreational league sports games going on, including soccer, kickball and softball. There were families just out enjoying the nice day (which was fleeting, as I’ll mention shortly). There were the requisite tourists chatting animatedly in unknown languages. Old men sitting on benches glaring at the masses. It was just a lovely spot to people watch, and I love the idea that all this space is here simply to be used as people see fit. At one point during my walk, a rain shower blew in very suddenly. There was nowhere for me to seek cover, but I didn’t really care – I had an umbrella, and the rain just offered a new selection of people watching. Admittedly, there was some schadenfreude present as I watched the umbrella-less masses scramble for cover as I continued to amble casually, smart enough to pack for all weather. But there were also those who didn’t have umbrellas and who realized they were going to be soaked no matter; they decided not to run but instead keep a leisurely pace and simply enjoy the cool rain, smiles on their faces. There were also the hardy soccer players who weren’t about to be deterred by a little water and instead accepted that their playing field was now a pool of mud. 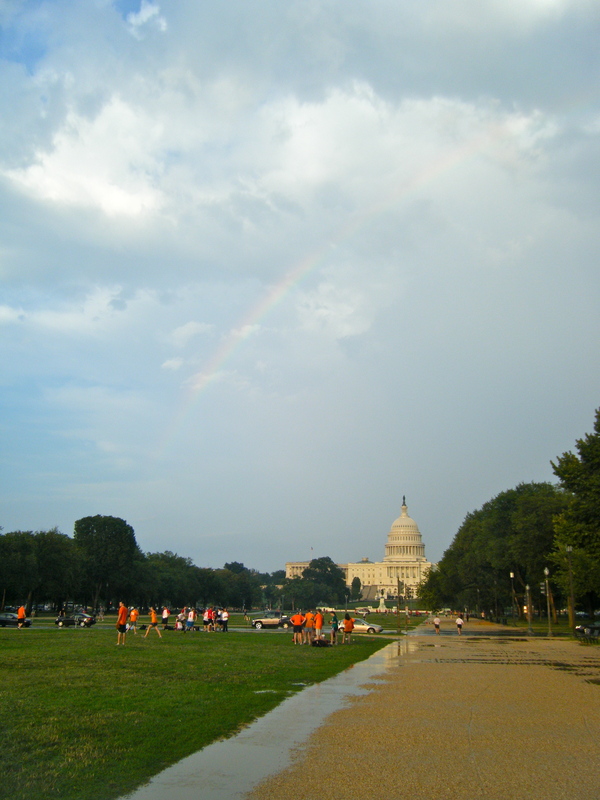 The rain was brief and there was a payoff in the end – a rainbow over the Capitol. It wasn’t the brightest rainbow, but dammit it was a rainbow and who am I to complain? Hell, I don’t know what I would have done if it was brighter, or even a double rainbow. Perhaps, then, to call the Mall America’s Backyard isn’t quite as cheesy as I thought – if you want to get a feel for the people of America, it’s a good place to start.